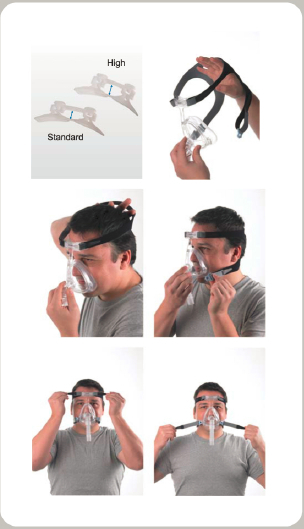 Get a secure seal on your APEX WiZARD 220 or 210 CPAP mask with this fully compatible headgear. Designed with quick-release hatches, the APEX WiZARD Headgear is as easy to use as it is comfortable to sleep in. Two straps connect to the forehead pad to distribute gentle stabilizing pressure, and the other two straps attach to the mask to create a seal and prevent air leaks. Enjoy a good night's sleep free of air leaks with the ApPEX WiZARD Headgear for 220/210. If you're tightening your headgear to the point where it's uncomfortable in order to get a good seal on your mask, you may need a different size mask. How should I wash my WiZARD Headgear? All headgear should be hand washed with a mild detergent and line dried. While some headgear may purport to be machine washable, we recommend hand washing to extend the life of your headgear. How can I ensure a good fit? Adjust your headgear a little at a time until your mask seals but is not uncomfortable. If you are unable to get a good seal on your mask, you may need a different mask size.